Sometimes you just need a little bling in your life. I'm a huge fan of chunky, men-style watches and this one from Canadian online retailer Olive+Piper satisfies my manly watch craving with something that is decidedly feminine. Yes, the chunky gold wristband is there and the over-sized watch face, but check out that ring of gems and that cute contrasting white band. So girly. 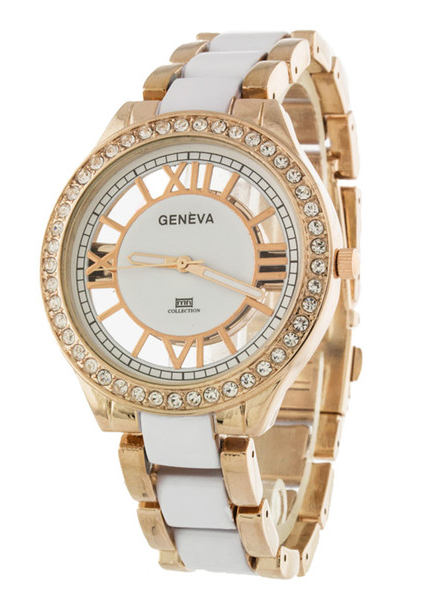 Sure, it's no Michael Kors, but hey, this one also won't cost you any sleep at night spending on.